The Truckee girls' tennis team poses with their Class 3A Northern Region trophy after a 10-8 victory over South Tahoe, on Friday, Oct. 6. 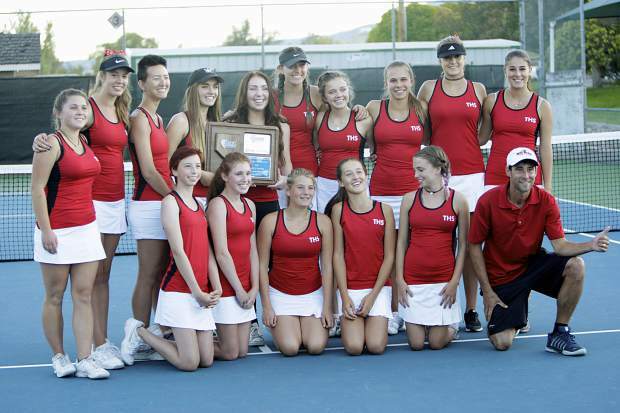 The Truckee girls’ tennis team proved to be the best squad in the Class 3A Northern League on Friday, Oct. 6, capturing the school’s third regional championship in four years. The girls opened the four-team regional tournament as the No. 2 seed after dropping the regular season finale against South Tahoe, but after taking a 13-5 win over Incline in the semifinals, the Wolverines exacted revenge on the Vikings in a 10-8 victory to claim the regional title. “We lost our second meeting with South Tahoe this season, so that was a bit of a wake up, and we knew that we would have to come in hard,” said Truckee Head Coach Henry Ryerson. One of the key factors in Truckee capturing the regional championship was the play of senior Kylie Greeno, who went 3-0 in her singles matches for the first time against South Tahoe this season. Senior captain Rebecca Ziegler also went 3-0 on the day. The Wolverines also had a singles win from senior Emanuela Bosio. On the doubles side, sophomores Courtney Engberg and Rachel Heath went 2-1 on the day, and Senior Sarah Jane Shaffer and freshman Lilah Abarno also added a win for the team. Truckee also had senior Cass Dalsey, sophomore Jasmine Posada, sophomore Kira Collins, and sophomore Isabella Ferrera competing in the tournament. With the victory the Wolverines will head to Las Vegas on Oct. 19, to face the Southern Region‘s No. 2 team, Boulder City. The Eagles came into the Southern Regional tournament as the Sunrise League regular season champions, and reached the finals before dropping a 13-5 match to two-time defending state champion, The Meadows. South Tahoe will have the formidable task of taking on The Meadows in the opening round of the state tournament. Before the teams head to Las Vegas for the state championships, they will first participate in the Class 3A Northern Region individual tournament on Friday, Oct. 13. Ziegler will enter the tournament as the No. 4 seeded singles player, and will face Churchill County senior Abigail Ritts in the opening round. Ziegler won 6-0 over Ritts in the players’ only meeting this year. Bosio will come into the tournament as the No. 2 seed and will receive a bye in the opening round. Greeno will enter as the No. 6 seed, and will play No. 11 seed, South Tahoe’s Allyson Cromwell. On the doubles side, Engberg and Heath will come in as the No. 2 seed, and will receive a bye in the opening round. Shaffer and Abarno will come in as the No. 5 seed, and will face off against a duo from Sparks. Collins and Ferrera will also play for Truckee, coming in as the No. 7 seed, and will face Incline Village juniors Carolyn Eppolito and Taylor Redfern. The individual tournament is scheduled for a 9 a.m. start at the Tahoe Donner Tennis Center. The semifinal and final round will be the following day, beginning at 9 a.m.